Years ago, before I became an image consultant, I longed for my very own Fashion Fairy Godmother. Someone who could tell me (with kindness and grace, of course) whether something looked good on me. By myself I just floundered. One minute I would think something was fine and the next…well…not so much. Or, I would buy one fabulous piece and it seemed that nothing I paired with it worked…sigh… I cringe at some of the outfits I put together and at the money I wasted. Thankfully I found her—an amazing Fashion Fairy Godmother who changed my life (and my relationship with my wardrobe) forever. I finally had someone who could help me understand the why’s of personal style…of MY personal style and I learned how to dress with greater and greater success. I felt better about how I looked. I felt more authentic in my choices. I stopped wasting money on things that just sat in my closet. When I made a mistake I knew why so I wouldn’t keep repeating it. It was life-changing, to say the least, and I am forever appreciative that I had her to guide me and answer my seemingly endless questions. Her inspiration went beyond understanding the elements of creating a beautiful wardrobe. She also encouraged me to share what I learned with other women to help them find the same relief. That was 30 years ago. worries that she’s destined to feel frumpy for the rest of her life. often declines invitations because trying to figure out what to wear for the occasion feels too hard. It’s easier to stay home and spare herself from feeling so self-conscious. I could go on and on and I suspect you can relate with similar stories of your own. If so, please keep reading. I regularly work with my private clients one-on-one. But, I also know that not everyone lives close enough or can travel to me so that can happen. Because of technology, we live in an age where help is a click away and that’s what I’ve created for you. But, technology by itself can feel cold and still leave you feeling confused with no relief from your frustration. This is exactly why I have created the ‘Styled by Ginger’ program. Every month I will share some combination (4-5) of these tools and, as you can see, I will be very active in the program. You, too, can have your very own Fashion Fairy Godmother…me! Once a month I will personally assist one or two women (on a first come, first-served basis). It’s as simple as sending me a photo of you in a garment or outfit with your question(s) about it. The style assessment will be done through video (either live or taped) and shared only with the supportive ‘Styled by Ginger’ community. I promise that it is all done in a gentle, positive, self-affirming way and will give you the answers you’ve been longing for. Does the color look good? How do I accessorize this outfit? And anything else you’d like to know. The information shared will help you and the other members watching learn how to tweak an outfit so it looks and feels fabulous. I know how personal our self-images are, so my suggestions are always given gently and with sensitivity. “It is so eye-opening to see how small adjustments can make such a big difference to an outfit. And I love how diplomatic you are and appreciate that when you are giving feedback you are not doing it from you being right and the other wrong but from a genuine desire to have that person access the possibility for their inner self to shine. You say it with such compassion and caring and it’s such a gift to tell people what you see so that they can build the distinctions for themselves. You can watch the style assessments (whether yours or someone else’s) and pick up real-life tips and suggestions and put them to use for yourself. One of the biggest frustrations I hear from women is, “How do I know what colors look good on me?” I also know this uncertainty is why women default to wearing black or gray. They feel that at least they will look okay in those colors and will blend in rather than take the risk of standing out uncomfortably in a less than flattering color. 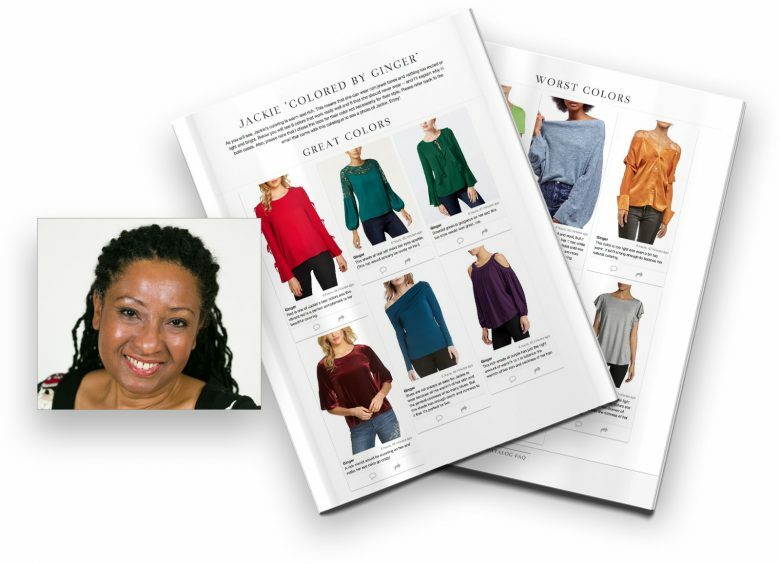 In the ‘Styled by Ginger’ program I will periodically show you how to choose colors (a few best and worst!) for a variety of skin-hair-eye colors. I will do this on members of the ‘Styled by Ginger’ program who want some guidance in this area and you can use this information to make color choices for yourself. This is Jackie… click below to see the full set of 6 best and 6 worst colors I chose for her. Please note that when I do the ‘Colored by Ginger’ I am going by the coloring I see in an online photo which may or may not be perfectly accurate. While it might not take the place of having a full personalized palette done,** it will absolutely get you moving in the right direction and boost your confidence in selecting colors that look good or avoiding those that don’t which is equally as important (as you can see by what Judy said above)! In fact, I go one step further to make it easy for you. I will show you specific, buy-able (with one click) clothes and accessories and I will explain why they work or why you should avoid them. Each month I will select a specific topic and will show you lots of ideas with direct links to the stores. still wear my black clothes while I add colors that are more flattering? complete an outfit instead of always feeling like something is off? accessorize without feeling like it’s too much or not enough? add flair to an outfit without breaking the bank or making me feel uncomfortable? choose shoes (flats and heels) that complement an outfit? As you can see, the list is endless and I will continually solicit suggestions from the ‘Styled by Ginger’ members. 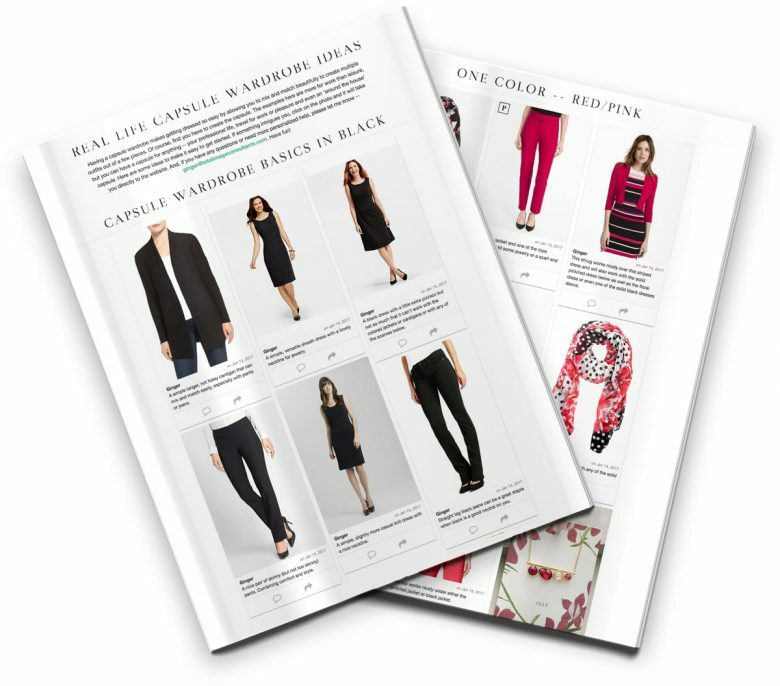 See the article about capsule wardrobes HERE and if you click on any photo in the article it will take you to the specific wardrobe ideas I suggested. No more wading through endless dreadful clothing choices to find one possible winner. You will stop wasting precious time wandering around a store getting more and more frustrated with each step you take. I do the work for you and deliver a carefully curated selection of the best options…and I explain why I chose them. 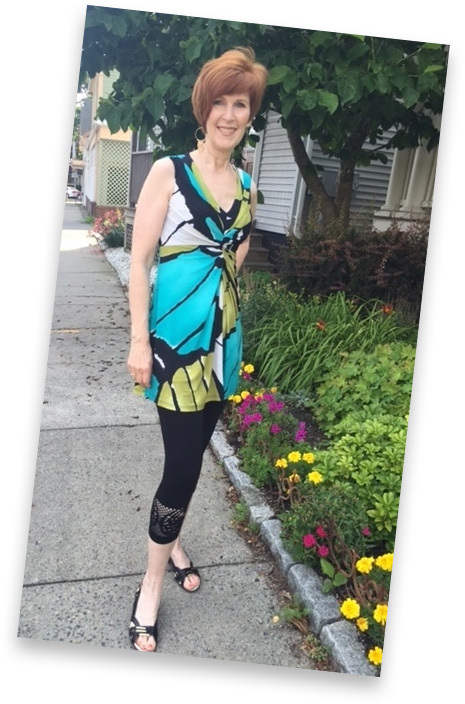 I show you a variety of sizes (petite, regular, plus sizes and sometimes tall when available), price points, colors and styles for different body types, lifestyles and personalities. Purchasing is just a click away. You can click on any of the pictures of clothing items or accessories and it will take you directly to the website. If it suits your style and budget you can purchase it directly from the store’s website. Yay! Shopping done! I choose clothes from a variety of stores like Nordstrom, Macy’s, Lord & Taylor, Dress Barn, Bloomingdale’s, Kohls and many, many others. You will learn how to make more informed choices the next time you shop. For instance, perhaps a style I show is exactly what you want, but the color isn’t one that looks good on you. You can do your own search for a similar style in a favorite color. That alone will make your shopping experience more focused and ultimately more successful. So many times in my life I have said to myself, “Oh, yes, I want to do that!” and then somehow I keep putting off whatever has inspired me. I put it off and put it off and put it off until after a while it’s only a distant memory and I am no further along with my progress than I had been before. I find that this happens often for women when it comes to fashion and creating a wardrobe. It is so easy to find a million other things that demand your attention rather than focusing on how you look and, more importantly, improving how you feel about how you look. As a result, months, seasons and even years can go by and nothing has changed! And, you get more and more discouraged. That’s where the monthly fashion challenge comes in. Each month, often based on the theme for that month, I will encourage you to practice what you have learned. It will be something simple so you can experience success without having to set aside hours to do it! Find shoes to go with a new outfit. There are a million different possibilities and each one will be designed to give you immediate results and help you smile when you get dressed. You are invited to post your results on the private Facebook page to celebrate and get support. Not only will you have my guidance, but imagine what you can learn from seeing what others choose—it’s a great way to be inspired! I will offer you a fun, simple fashion challenge that will keep your wardrobe and your look feeling fresh and new. Hey, there might even be occasional prizes! Nothing I choose is random. It all has a purpose and my thought process behind each outfit is something you can experiment with within your own wardrobe. You can even share your successes and questions in a private Facebook group. This category has so many possibilities and these specials will only be available to those who are part of this program. They can include special discounts from retailers, resources I use with my private clients and much more—I already have some lined up! I have also seen what happens when women support each other—sharing resources and ideas—or simply encouragement. This happens organically when there is a sacred space for women to express their fears and joys around creating a look they love. For this program, I will offer a private ‘secret’ Facebook group where you can have that same experience and only members of this program can see the posts—in fact, no one except us will even know this group exists. Share what you have learned so far. Share resources that have helped you. Post your experience with our monthly ‘practice lesson’—celebrating your successes and asking for help when needed. Talk with other women about your experience in creating your dream wardrobe—your challenges and successes. Ask wardrobe and style questions that have been bewildered you and get my feedback. Receive my insights as I oversee the group. Of course, if you prefer not to be part of the Facebook group, that’s fine. You will still receive all the other components of the program. How Do You Get All of This? I have made it easy for you! All of the information will arrive in your inbox to make it easy for you to find it. This is a monthly program so the cost is kept low and once you sign up your payment will happen automatically each month. You can cancel at any time and all future payments will stop. Imagine how much money you will save when you understand what not to buy and how to put outfits together. And, where you can ask personalized questions. You can revel in the time you will save having my guidance to support you as you get dressed each day and shop for items to add to your wardrobe. I look forward to having you as part of the ‘Styled by Ginger’ community and, of course, if you have any questions, please let me know. ***Cancellation & Refund policy: Once you join the program, your credit card will automatically be billed each month or each quarter depending on which payment plan you choose. I hope you love the program, but if you choose to cancel your subscription you can do so at any time and your payments will stop. There are no refunds given. If you cancel you will have access to the material through your next payment date at which point all payments will stop and you will stop receiving the program materials.